Go Media's Weapons of Mass Creation Fest - Go Media™ · Creativity at work! This year, Go Media has set out to create a more intimate experience for the design community - WMC Off-The-Grid. WMC Off-The-Grid is a three-day weekend retreat aimed at freelance and in-house graphic designers, small business owners and other design-minded creatives looking to step away from their screens to get advice from our expert faculty. Our attendees will come away with tangible tools and action steps they can use to grow their businesses and become more confident designers. This intimate event is open to under 60 attendees, speakers, workshop leaders and staff. Located at Mohican State Park in Loudonville, Ohio, the WMC Fest community will come together in small cabins to bond over campfire and their love for creativity. Graphic designers. Illustrators. Web Designers. Students. Freelancers. Entrepreneurs. Musicians. Teachers. Photographers. Artists. Business Leaders. Go Media fans. Photographers. Gamers. Makers. Creatives of all kinds. WMC brings attendees and content curators with various backgrounds, experiences, and demographics. More than 60% flock from other cities and creative hubs like NYC, Chicago, Los Angeles, San Francisco, and Portland. We see our creatives traveling in from as far as the UK, India and Australia. Together, our collective goal is to: Create. Share. Inspire. Weapons of Mass Creation 2014 from Weapons of Mass Creation on Vimeo. 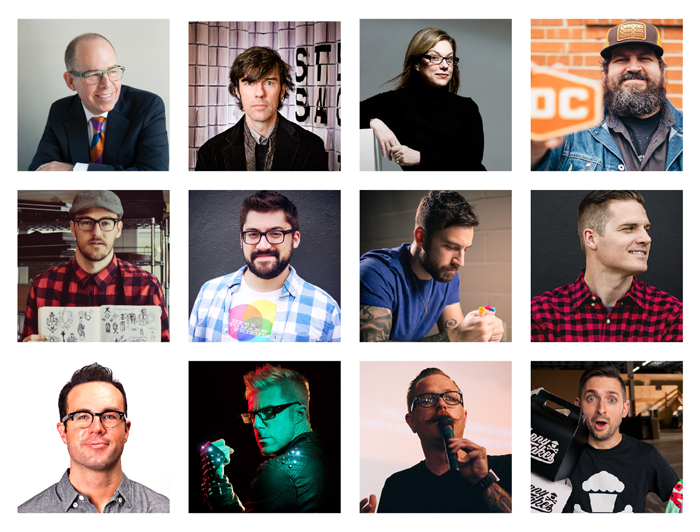 Alumni include Stefan Sagmeister, Michael Bierut, Debbie Millman, Tad Carpenter, Aaron Draplin, Austin Kleon, Brandon Rike, Chuck Anderson, Dan Christofferson, James White, Johnny Cupcakes, Mark Brickey and the Adventures in Design Podcast, and Jon Contino and National Poster Retrospecticus.